The primary research focus is on developing new strategies and test protocols to differentiate middle ear problems in newborns, children, and adults. The MEl has been equipped with Laser Doppler vibrometry (LDV) through the grants awarded by Canadian Foundation for Innovation (CFI) and British Columbia Knowledge Development Fund (BCKDF). 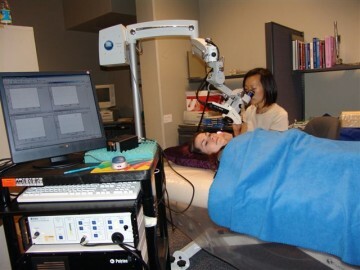 LDV is a well established technique used throughout the hearing research community for dynamic measurements of temporal bones, ear models, implantable hearing aids, and middle-ear prostheses and implants devices, however, its potential as a clinical system has not been fully explored. This method is a non-invasive and non-contact technique that can measure vibrations of a small object (size can be quite small < 1.0 mm) with extremely high accuracy (in nanometre range). Therefore, it can be used to measure the sub-microscopic movements of eardrum and middle-ear ossicles in response to a sound. The movement of a light-reflecting surface causes a Doppler shift in frequency and phase of laser light, which can be detected and analyzed using interferometer. Middle-ear diseases such as OM can effectively change the vibration pattern of eardrum and ossicles, therefore, this techniques has potential to diagnose otological diseases. Because of its accuracy, reproducibility, ease of use, high resolution of scanning, and the ability to obtain measurements without touching the object, this method may provide a breakthrough in analysis of middle-ear.